James Hetherington was born on 27th September 1871 in County Tyrone. James emigrated to Canada. 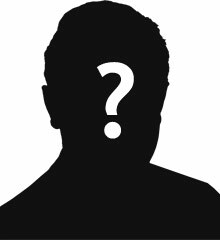 James served with the 5th Royal Highland Regiment of Canada for 17 years. James was living at 362A St Antoine Street, Montreal, Quebec when he enlisted. He was working as a mason. Private James Hetherington had a brother-in-law Robert Davidson, who lived and worked as a labourer in Ballynasaggart, Ballygawley. James arrived in Ballygawley just before Christmas 1916 to stay for a week. Private Hetherington left by train on 27th December to rejoin his unit, the 148th Battalion of the Canadian Infantry. Unfortunately, at Belfast railway station, Private Hetherington had exited his train on Platform 3 and was walking across the tracks to Platform 4 when he was hit by another train. He was killed instantly. 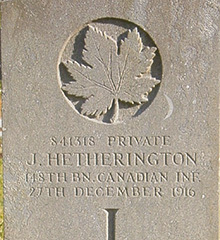 Private Hetherington is buried in Belfast City Cemetery.